On 9 June 2016, I began tracking my Emotions every day. At the end of the experiment, which coincides with the Diploma Exhibition of my masters project, I will display in some form 365 days of my Emotions. Collecting sample data, in the same form to be tested in user groups, in order to use in iterations of the Visual System. Learn by doing. Through tracking my own data, selfishly I increase my own ability to communicate and express myself. I also experience some of the same struggles that my user groups will experience when I test the fine-tuned iterations of my Visual Systems. Sometimes I experience a range of Emotions, so for my own tracking I also include smaller, perhaps more Feelings than Emotions. Examples include: Homesickness, Alienation or Insecurity. I note some of the main events that happened throughout the day to help provide a second layer of data that can be linked as triggers to the Emotions that I experienced. I track each of these variables on a scale of 1-5. The lower end of the scale representing Low Intensity, Low Valence (Negative), Low Arousal, Low Conducivity (Obstructive), and Low Control. The higher end the opposite of each respectively. You can read a more comprehensive description of the dimensions here. Patterns in same/similar major Emotions and their variables. i.e. : Joy tends to be recorded as a High Intensity Emotion and Disappointment tends to be recorded as a Low Arousal and Low Control Emotion. The absence of a pattern in tracking similar/same Emotions is also interesting and very relevant. Perhaps it is being mis-tracked or specific events have triggered a different form of that Emotion and could be labeled in a more nuanced manner. Difficulties in tracking variables. 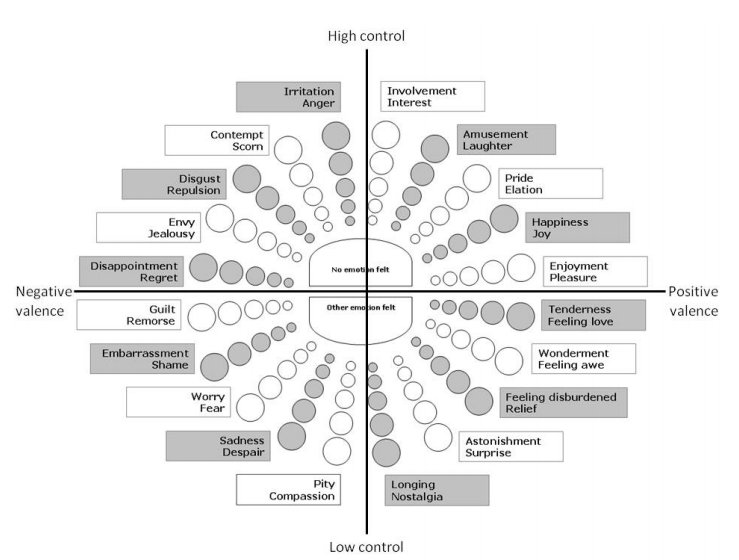 Is there a correlation between difficulties and specific emotions? Does the system of using 1-5 work for all variables? Is there such a strong correlation in some variables that one can be left out or combined? Difficulty in choosing one major Emotion or labelling an Emotion at all. Of course tracking my Emotions and testing my own Visual Systems does not scientifically prove anything. Other than that the person who knows the most about the design of the system is able to use it. However, “dogfooding” has its advantages. By using my own tool, I have a better understanding of a users perspective, therefore building empathy for them. I am better informed and prepared when users give me feedback about certain elements of a system or tracking process. I am also using the tool in my real life. This gives me a sense of how it feels to write down your personal experiences, feelings - and heart - every single day. Skip ahead and read my reflection after tracking my emotion for five months. As mentioned in the previous blog, Explorations II, my research has guided my design process toward developing a system in which the 5 variables used to track Emotion are based on metaphor.